Collaborative filtering is an approach to product recommendations in which recommendations are made based on a user’s product interaction history combined with the interaction history of all other users on a site. Collaborative filtering collects and analyzes massive datasets of user behavior and activities, and mines that data to predict who will purchase what. There are a number of approaches to collaborative filtering. One approach is the “neighborhood approach,” in which users are recommended products that similar consumers have engaged with previously. For instance, let’s say a user named Jennifer has displayed interest or engaged with a certain line of luxury handbags. Now let’s say that other women who have displayed similar interests and behavioral patterns as Jennifer proceed to interact with a particular line of high-end perfumery. Through collaborative filtering, a recommendation engine will present to Jennifer the perfumery products the other women have engaged with. A more advanced approach that we take at Dynamic Yield is called matrix factorization. 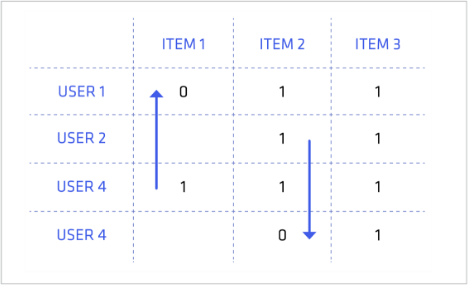 Put simply, this approach looks for calculated item properties (that are not directly accessible to the algorithm) and then matches users with items based on how important the property is to the user and the level at which the item possesses that property. Sometimes these properties correspond to intuitive properties such as color or brand, but more often, these are abstract mathematical properties. A distinct advantage of collaborative filtering is its broad applicability; collaborative filtering algorithms don’t need to understand the essence of a particular item, and are capable of accurately recommending a wide range of products. Further, collaborative filtering allows brands to enable serendipity shopping for their consumers by presenting items they would not have necessarily sought to purchase.